In the chaos of the final days of the Italian revolution a thief and a baker hook up and travel the streets of Milan witnessing the historic events, which quickly take a dark turn. Dr. Braun: [to Carlo] You know, you have very beautiful eyes. Q: What are the differences between the US VHS Version and the Uncensored Version? The second film from the great Dario Argento, following his excellent depute film Bird with the Crystal Plumage (1970), is a lengthy but enjoyable thriller. Reporter joins with a blind old man (and former-reporter) to solve the mystery of why someone is killing people involved with genetic research. 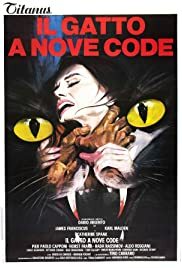 While granted Cat O' Nine Tails doesn't rank with Argento's earlier film (or his later ones for that matter) it is still an atmospheric and well-made giallo thriller that is worth a look. The mystery is a well-mounted one with some nice twists to be had. The roof-top climax and shocking conclusion is quite worth the wait as well! The direction is sleek and the music score of Ennio Morricone is beautiful. Cast-wise the film is good as well, James Franciscus and Karl Malden steal the show though as an unlikely pair of investigators. Most people don't rate this film as one of Argento's best, even Argento himself declares it his least favorite film, but Cat O' Nine Tails still deserves to be seen - if only by Argento fans.